Wendy Reid and African Grey Parrot Lulu are co-composers of AMBIENT BIRD 433, an hour-long interspecies sonic landscape/ambient environment to be performed at the Forum, Frank Ogawa Plaza, featuring the birds and sounds of the plaza with birds Lulu, Shooshoo and humans Wendy Reid, Brenda Hutchinson, Aurora Josephson, Ron Heglin, the MILLS CONTEMPORARY PERFORMANCE ENSEMBLE and musicians of FROGPOND 433. Buy yours today at Eventbrite CLICK HERE! 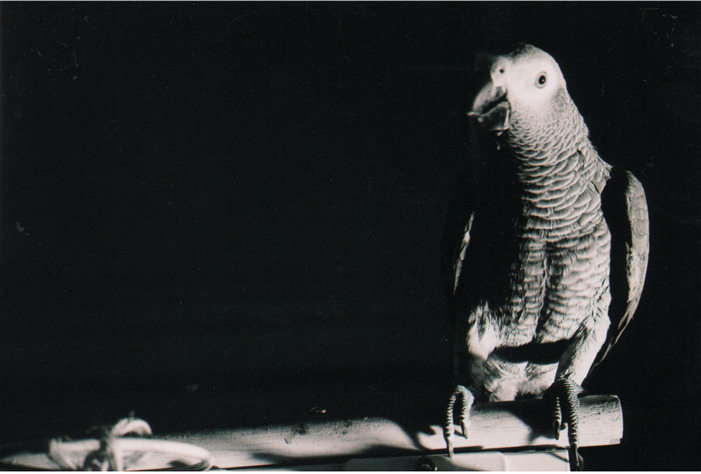 AMBIENT BIRD 433 for 3 open ensembles is a ‘bird chaconne’ with a 4'33" extended ostinato created from sonic fragments of the African Grey Parrot Lulu, transcribed into a spatially notated score to be interpreted and performed by musicians in an outside, ambient environment. The three performing ensembles, featuring some of the top experimental musicians of the Bay Area, create the ‘continuous variations’ throughout the performance. WENDY REID (b. Los Angeles, 1952) received degrees from Mills College (M.A. ), the University of Southern California, School of Performing Arts (B.M. ), and attended Stanford University, Center for Computer Research in Music and Acoustics. Between 1975-77, she was a private pupil of Nadia Boulanger in Paris and Les Écoles D’Art Americaines at Fontainbleau. Composers she has studied under include Terry Riley, Robert Ashley, Halsey Stevens, James Hopkins and film composer David Raksin. She is the recipient of numerous awards and grants including Meet the Composer/California, Meet the Composer/New York, Subito grants, an ASMC grant and the Paul Merrit Henry Prize. Her works have been performed and broadcast throughout the United States, Europe and Asia by the Abel-Steinberg-Winant Trio, the San Francisco Contemporary Music Players, the Kronos Quartet, Other Minds 19 (Charles Amirkhanian), the New Music Works Ensemble, the San Francisco String Quartet, Ruffled Feathers, Brassiosaurus, the Tree Ensemble, and others. Reid is producer of the new music series NEW MUSIC WITH BIRDS, FROGS AND OTHER CREATURES sponsored by the Natural Sciences Department of the Oakland Museum and the San Francisco Art Institute, and currently teaches music composition at Mills College and violin at Holy Names University PMD. This performance is made possible by the Fleishhacker Foundation and the Zellerbach Family Foundation.